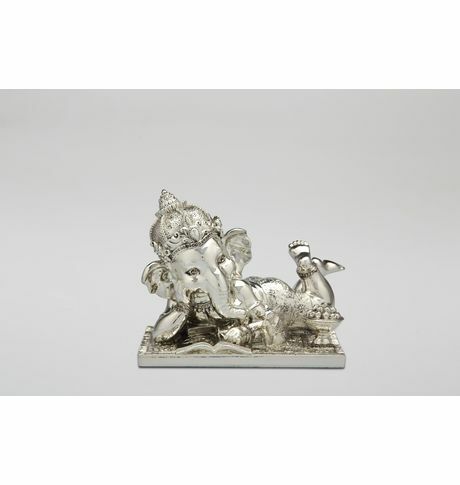 Elevate your home furnishing with this adorable baby Ganesha idol in a resting position. The beautiful piece adds divinity to your home space as well as beautifies your room. Place it in the living room or at the corner of any room.Easy to maintain. Elevate your home furnishing with this adorable baby Ganesha idol in a resting position. The beautiful piece adds divinity to your home space as well as beautifies your room. Place it in the living room or at the corner of any room.Easy to maintain.Cancellation and Return Policy: • Exchange allowed post booking • No order cancellation or Refund transaction allowed at the store.